Seeing green this time of year is bad! 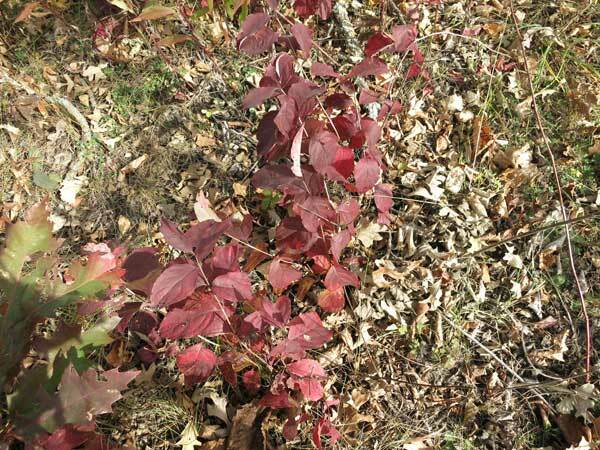 By late October most of the native species have either turned color or lost their leaves. Anything green now is almost certainly nonnative (bad). 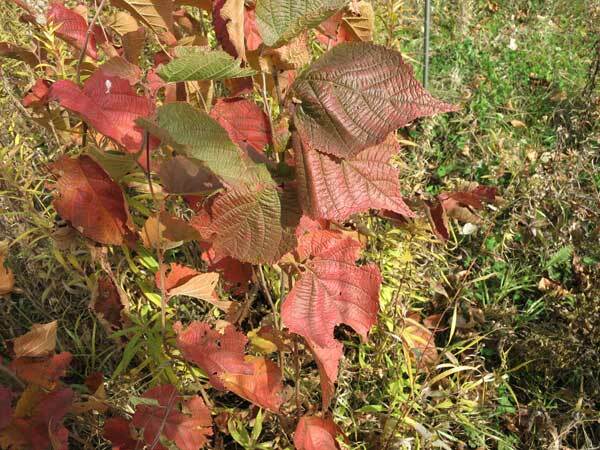 This is a great time to survey for invasive brush which, because they are still green, really stand out. Buckthorn and other nonnative shrubs: Buckthorn, in particular, really stand outs, as the photo shows. 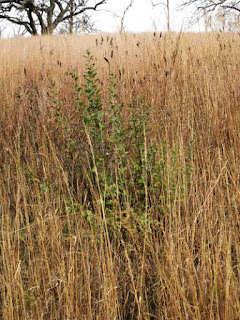 Note that this buckthorn plant is a new vagrant in a tall grass prairie that has been burned annually for the past 15 years. This shows two things: 1) Fire will not eradicate buckthorn; 2) The buckthorn rootstock has a long persistence, since this plant is new in 2015 in an area that had been cleared of buckthorn in 1998! 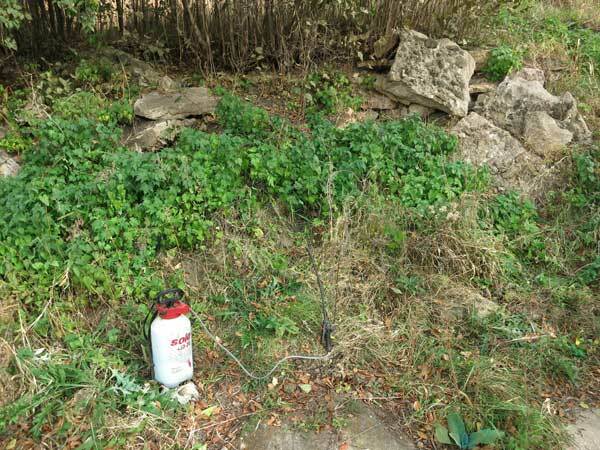 However, this is probably not a good time to use a foliar spray on this bush. At this late in the season, one can't be certain that the herbicide will still be translocated to the roots (which is essential if this bush is to be eradicated). However, basal bark with 20% Garlon 4 in bark oil will work 12 months of the year, and this is how Amanda dealt with this plant. 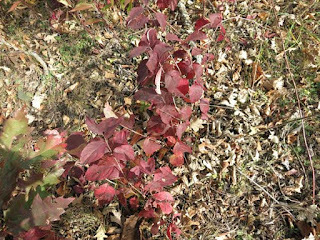 Nonnative herbaceous perennials still green: Lots of nonnative herbaceous perennials retain their green color long after native species have senesced. This includes such culprits as garlic mustard, hedge parsley, sweet clover (1st year plants), mullein, burdock, catnip, and motherwort. This is an excellent time to foliar spray these plants with 2-4% glyphosate. The rule is that only green leaves will take up glyphosate and translocate it to the roots. Since most native species have senesced, there is no danger of peripheral damage. This time of year, all of our Solo backpack sprayers have been put away for the winter, but the Solo 2 gallon hand-held sprayer was still available and worked well on this small area. It took about 15 minutes to deal with this patch. A nearby patch of catnip was also treated. and has been a difficult area for us to restore. Motherwort and catnip are continual problems. Note the handy Solo sprayer. 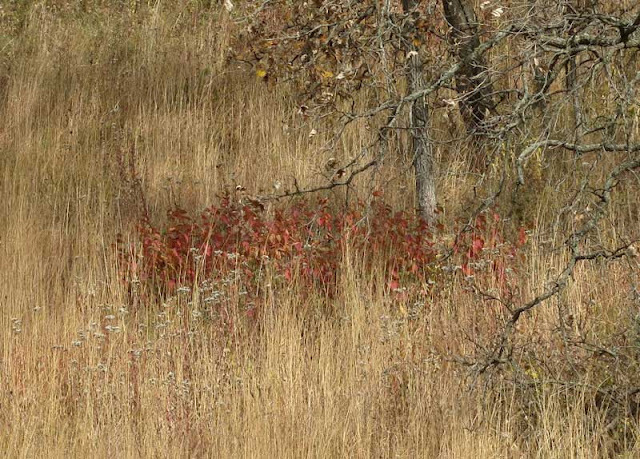 An exception to the "rule of green": A number of native species do exhibit the phenomenon of "fall regrowth" so a few native green plants may still be present. These are usually found as rosettes near to last summer's senesced stems. Generally, these are easy to spot and should obviously not be sprayed. 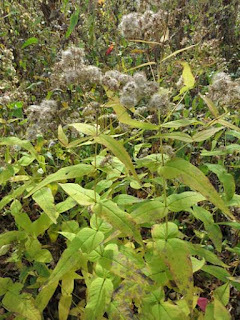 Upland boneset (Eupatorium sessilifolium) is a Special Concern species in Wisconsin and Threatened in Michigan. As the Wisconsin State Herbarium map shows, it has a narrow distribution in the southern part of the state. It has a Coefficient of Conservatism of 9. 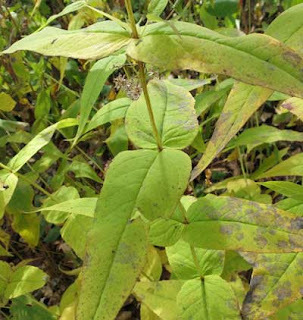 Note that E. sessilifolium can be easily distinguished from the much more common tall boneset (E. altissimum) because of its sessile leaves (see photo below). In the early days of restoration at Pleasant Valley Conservancy we had only a single stand of 5 stems at the SE corner of Unit 8. We raised seedlings in the greenhouse and planted transplants in likely areas in the Conservancy. 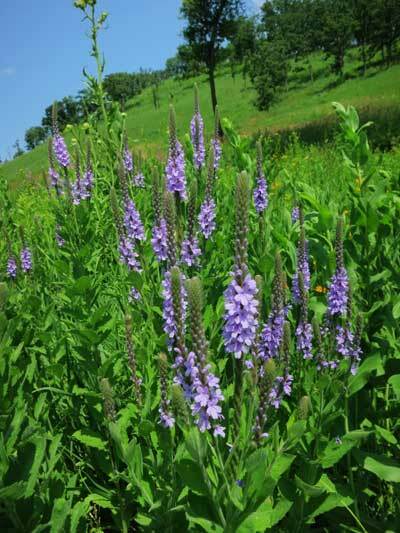 Most of these transplants grew and we now have this species in a number of good savanna sites. In addition, it has spread on its own from the original stand and there are now many plants in other parts of Unit 8. We have been working with upland boneset for over ten years now, and have found that despite the lush flowers and seed heads, germination of seeds is below 5%. However, the species transplants well, so that those seedlings we have been able to raise generally become well established. The population shown in the photos here was part of a transplant series that has flourished in Unit 19C. Update 26 October: Yesterday I discovered a new large patch of upland boneset just south of the South Firebreak in Unit 5. Kathie and I counted over 20 flowering stems. Nice to know this species is spreading on its own. The sessile leaves are an unmistakable characteristic of Eup-sess. I have posted on Canada goldenrod eradication in the past. My method was a leaf spritz with a low-volume high-concentration of Garlon 4 herbicide diluted in bark oil. 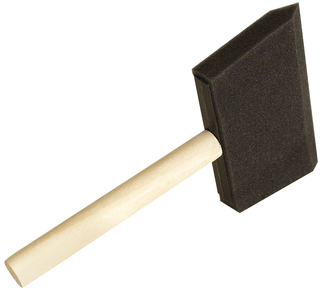 [One part Garlon 4 and four parts bark oil.] A few leaves in the upper part of the plant are given a quick spray. This works well, but has the disadvantage that a small amount of herbicide mist might fall on "good" nearby plants. Kathie has developed a modified procedure that permits better control of the herbicide. She uses a foam paint stick soaked with herbicide. Instead of spraying the leaves, she makes a gentle 6 to 10 inch "swipe" up the stem somewhere about waist high. To be certain that no stems are missed, she bends over the top of each stem as it is treated. She carries a small spray bottle to reload the foam from time to time. A Canada goldenrod clone treated about two weeks earlier. The kill rate is about 99%. 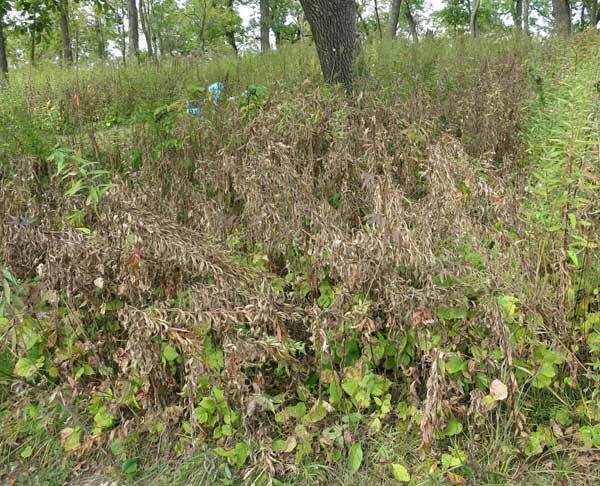 Note that there is no peripheral kill on nearby Desmodium glutinosum plants. 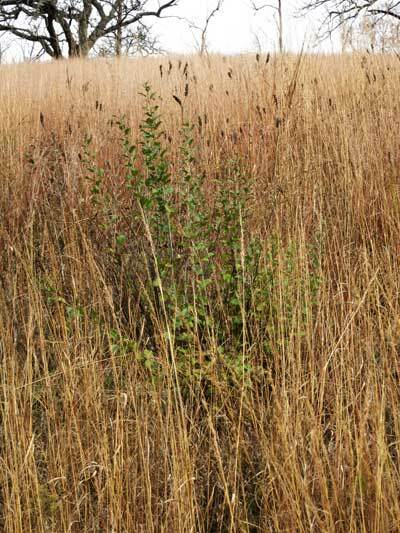 The ideal time to treat Canada goldenrod is from early August through early September, when the plants are in flower. At that time, the plants are large enough to find easily, no stooping is involved, and there is still time enough to return and treat any plants that were missed. Multi-year studies with the leaf spritz method showed that it was possible to completely eradicate a clone. We anticipate the present modification will be equally effective. 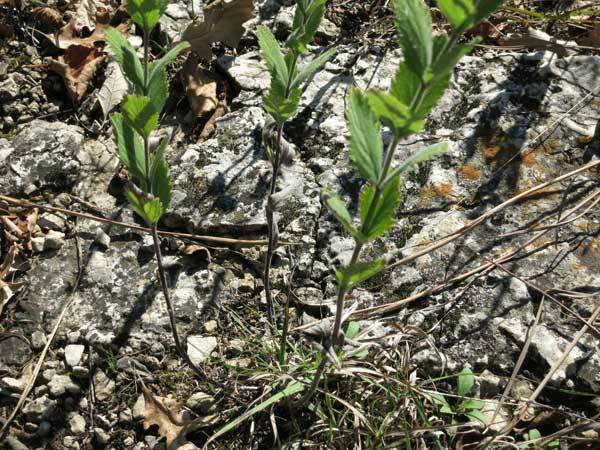 In the Driftless Area there are many rock outcrops on which plants appear to be "struggling" for survival. If such an area is fairly large it might be called a "barren" or "bald", depending on its location. The plants that are growing on rock outcrops are sometimes called "disturbance species", because they may also grow in areas that have suffered considerable human interference. When we first started restoration work, the East Overlook was heavily colonized with buckthorn, reasonable since this calciphile does well in dolomitic habitats. Years of work have eradicated the buckthorn, and now the site has only native species. In the spring, small populations of pasque flower and prairie smoke are present. Later columbine can be seen, followed by hairbell and whorled milkweed. perhaps adjacent to a path. Yesterday Kathie and I did a species list for this small rock outcrop. In addition hoary vervain, we found big blue stem, side oats, little blue stem, prairie dropseed, hairbell, whorled milkweed, Kuhnia, Carex eburnii, cream gentian, silky rye, and woodland brome. Also present was a single large eastern red cedar (carefully protected from fire) and several bur oak grubs. Thankfully, there was no buckthorn! Anyone interested in rock outcrop communities would be advised to access the valuable book edited by Roger C. Anderson, James S. Fralish, and Jerry M. Baskin, 1999. "Savannas, Barrens, and Rock Outcrop Communities of North America." Cambridge University Press. It has 36 chapters that cover the whole of North America, from southern Florida to subarctic Canada. Although I bought this book because of its extensive treatment of North America savannas, I found the chapters on barrens and rock outcrops also interesting. If you are a "plant" person and do much travelling in North America, this is an excellent book to take along. Here are few examples: New Jersey Pine Barrens, Serpentine Rock barrens of Eastern and Western North America, Granite Outcrops of Southeastern U.S., the Cliff Ecosystem of the Niagara Escarpment, Alvars of the Great Lakes Region, Southern Ontario Granite Barrens. One of the areas Kathie and I visited was Mount Arabia, a site in the southeastern Piedmont region of DeKalb County, Georgia, where there was a large granite outcrop that had tiny islands of soil where primarily endemic species grew. Because of its endemic plants, this area has been protected in a state park.